How much of the time do you spend daydreaming in the water? If you want to supercharge your swimming, it’s time to focus up. 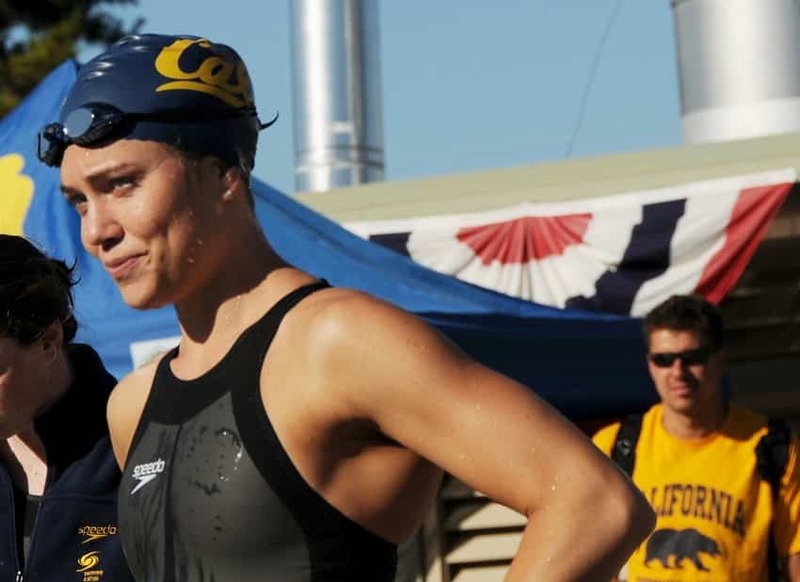 When Natalie Coughlin stepped onto the pool deck at Cal Berkeley as an 18-year old there was little indication that she would turn out to be one of the most dominant swimmers in Olympic history. Her teenage years had held promise. At the age of sixteen she’d already set three national high-school records and was pegged as a contender for the Sydney Olympics. In March of 1999, while in a full-on charge for the Olympic Trials the following year, after a particularly challenging practice, Coughlin woke up in the middle of the night with a piercing pain in her shoulder. The next morning at practice, she tries to help remove the cover on the pool. The pain sears through her shoulder to the point she can no longer move it. She’d torn her labrum, and what followed was fifteen months of physical therapy, consulting orthopedists and doing lots and lots of kick. Her goal turned from making the Olympic team to putting Olympic Trials in the rear-view. By the time she got to Berkeley the following fall for her freshman year, her relationship with the sport had rotted. Getting back into the pool and swimming fast would start with getting healthy—the Cal coaches recognized that Coughlin had developed some remarkable asymmetries in her shoulder and neck. The next step would be getting mentally squared away. And that started with being more mindful in the water. 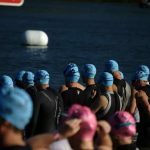 Of taking advantage of the hundreds of small improvements that were available to every athlete each day in the water. By December of her freshman year, Coughlin began to see some serious improvement from her increased focus. When the NCAA championships rolled around a few months later in March of 2001, Coughlin would hammer the NCAA records in the 100 backstroke, 100 butterfly and 200 backstroke. Coughlin would win her first of three NCAA Swimmer of the Year awards. Over the next decade, Coughlin unleashed a hurricane of world records and international medals. The first world record—also becoming the first woman under a minute in the 100m backstroke—came in 2002. She won five medals at the Athens Olympic in 2004. Broke the world record four more times in the 100m back. Six more medals at the Beijing Olympics. Another medal—her twelfth total—at the London Olympics. 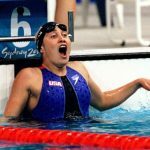 “In the backstroke specifically, there isn’t anyone in the world who has her efficiency level in terms of technique,” marveled Olympic champion and Alabama coach Jonty Skinner. Training with an eye on how she wants to feel in competition, and relentlessly trying to experience that in practice. “My best attribute is my ability to be highly focused for long periods of time,” said Coughlin. Here’s how you can dial up the focus in your own training. 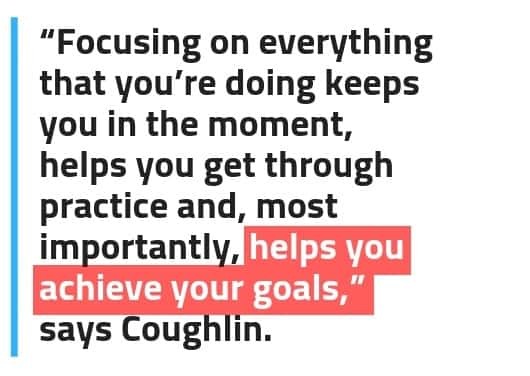 When Coughlin got started on being more focused up during practice that fall at Cal, she started off with visualization, a mental training tool popular with swimmers. But instead of just thinking about her perfect race in competition, she connected how she wanted to perform on race day with how she wanted to feel in the water at practice. 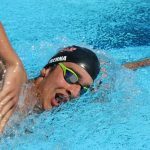 This connection between training and competition make the “dull” meters and yards in the pool more meaningful. 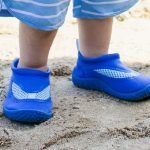 Instead of just slogging through the meters in order to get it over with, you are fine-tuning how you are going to swim when it’s time to go off the blocks. Pro tip: Picture how you want your body to feel in the pool on race day. Imagine the sound of the water rushing past you, the position of your body, the thunderous kick behind you propelling you. Write out some keywords that help you connect how you want to perform with how you want to train. For example, if on the first 50 of your 200-meter freestyle you are focused on “easy speed”, use this performance cue in training. Excellence doesn’t automagically happen because you complete one hard swim practice with killer focus. The shards of improvement, the decreasing stroke counts, the faster in-practice times, and the race day PB-smashing are a result of consistency. Make a heightened focus in practice routine. “Like any mindfulness training, it’s something that happens over time and takes a lot of patience and work,” said Coughlin. Being more focused in training isn’t an overnight solution—but you will see the improvement quickly enough. Work with your coach to make sure you are improving the right things. 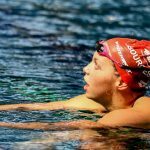 While you may intuitively know what you need to improve in the water, having feedback from your coach (and even from yours peers) will help you improve much faster than if you were to go at it completely on your own. Let your coach know that you want to become a more efficient swimmer. That you want to develop better underwaters. They will give you the feedback and support necessary over time to keep you on point and focused on the important things. Turbocharge your progress by combining your newfound focus with regular external feedback. Daydreaming is not going to help you cope with hard workouts or make practice go by faster. Being a more focused athlete takes work. It’s always going to be easier to let your mind go for a hike. 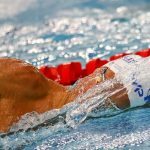 But being mindful of your stroke count, your technique—these things will give you a sense of deep satisfaction by the time you slide out of the water at the end of practice. Not only that, mindful swimming achieves the thing you believe daydreaming is doing for you—make the workout go by faster. 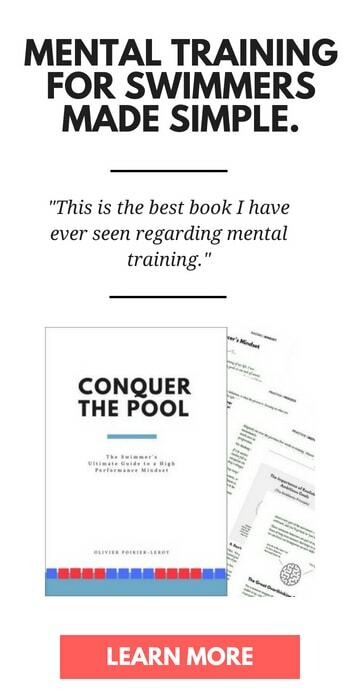 No matter where you are at in terms of ability, talent or ambition, putting in mental effort to your swim practices will help you progress. 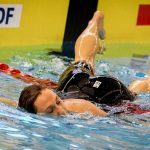 How Swimmers Can Learn to Be More Present in the Pool. Being present in the water helps you swim faster and more efficiently. Here’s how to do it. Havriluk, R. (2014). 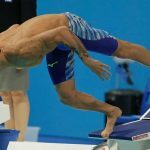 The effect of deliberate practice on the technique of national calibre swimmers. In Proceedings of the XIIth International Symposium on Biomechanics and Medicine in Swimming, Australian Institute of Sport, Canberra.